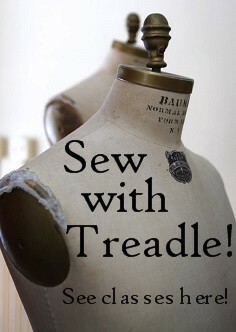 The Fine Fabric Stores Jacket Challenge submissions are in, and on display at Treadle. The voting will continue through February and then a team of unnamed judges will choose the 1st, 2nd and 3rd place winners. Sometimes we Treadlettes get to make models of our favorite patterns and hang them up in the store. I have one in progress, but someone else finished hers this week, and I am happy to share it here. 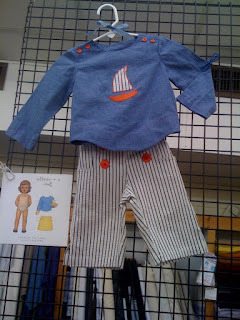 Today we begin another new feature of the Treadle Yard Goods Blog - Book Review Corner. Once or twice a month I'll choose a book that is either newly published or an old friend and let you know what we like or don't like about it. The first book on our list of favorites is Last-Minute Patchwork + Quilted Gifts by Joelle Hoverson. Joelle is the owner of Purl and Purl Patchwork in New York City, she is multi-talented having also written a Last-Minute book of knitting projects. Last-Minute Patchwork + Quilted Gifts came out in 2007, and I have enjoyed making many projects from this fantastic book. The projects range from 2-hour gifts like coasters, needlebooks and darling bird ornaments, to "more than 12-hour gifts" which are all quilts of varying difficulty. There is a section in the back called "patchwork + quilting basics" where Joelle lists all the tools and techniques necessary to make beautiful and successful projects. 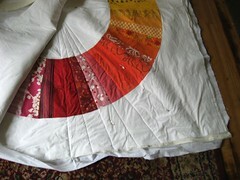 Her directions are very well-written, and I learned a lot about quilting and applique that I didn't know before. 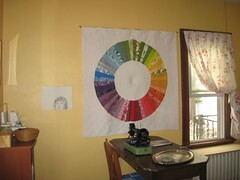 I have made a few things from this book, but my favorite project was the Color-Wheel Quilt. This quilt is on display at Treadle Yard Goods right now, so feel free to come and see it in person! It certainly took me more than 12 hours, but they were fun hours and the quilt is one of the family's favorites.